Maybe we can spell this out for you a little more.... Thanks, Amethyst. First fish gets the fly. Thanks for clearing that up Ashley. Since this is for the ACC, and people with autism generally struggle with metaphors (their tendency is to take them literally, and most autistic people have to memorise each common phrase like that to remember that it isn't meant literally), this is in fact a way of making it possible for autistic people to easily comprehend that it's a metaphor. The quotation marks may not be totally necessary, but they do serve a useful function in this case. am I missing something, or is Nat seeing "autism" where it in fact says "austin"? Yeah, that catalog kind of made me want to deny I go to school there. Well, that and that one of the actual final runners-up in the mascot search was "Bbhoggawact". The only circumstance under which I can envision even trying to pronounce that is as I'm huddled over the toilet. 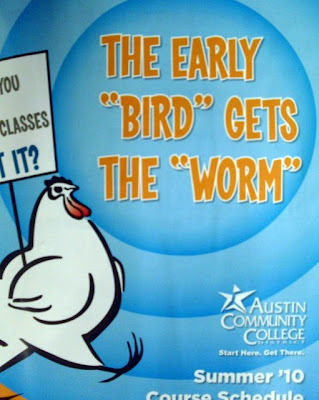 Wow-- I just moved to Austin, & I saw that on a billboard the first day I was here. I thought it must have been my imagination; guess not! What's most worrying is that this place is supposed to educate people. Woops, dyslexic slip-up there, my apologies. So, totally unnecessary then. 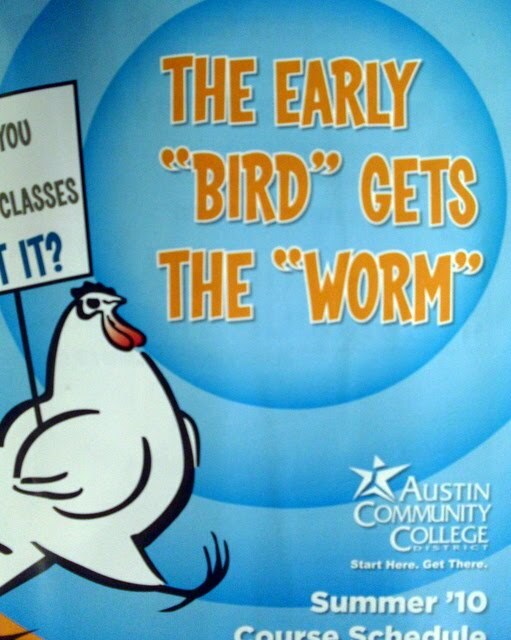 The ACC mascot is a rooster, and the photo cut off the context needed to understand the poster. This might be a lame joke, but the quotes are still used well. Misused quotes bug me too, but I think that on a site like this, where we're congratulating ourselves on our superior grasp of English, we should make very sure we're right before posting and embarrassing ourselves.